Yes, a LYS - Woolwinders sent out a plea for swatchers. One of their orders came a little early and so they held a Swatch-a-thon and promised hands on peak at the new stuff plus a discount on any purchases. 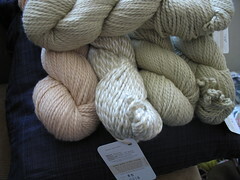 Well, despite having spent a bit at that festival thing, I am unable to resist a discount plus a chance to play with new yarn. In order to try and demonstrate some self control, I arrived early so I could purchase first. (heh). Hearing (and seeing) of several Diamond tanks in progress, I caved. (I had wanted to participate all along, but the first Sunday Salon I was out of town.) 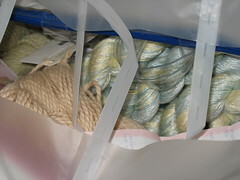 So, I bought some gorgeous Artyarns Regal Silk. 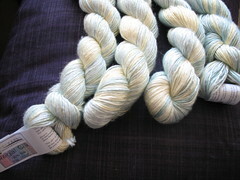 Beautiful yarn - you're making me want to go shopping!